Let’s be honest, we want it all, and why shouldn’t we have it all, we run the world. So when it comes to a tank, we need it to look cute, keep us cool, be supportive and discretely hold our necessities. 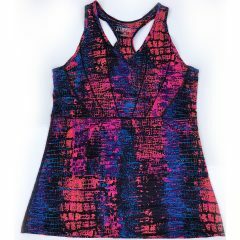 The Electric Tank is just that, a flattering semi-fitted tank with contrast mesh paneling and silky soft jersey to keep us cool and comfy; while a supportive shelf bra and cleavage alley pocket provides the support and storage a woman needs.